Checking into the newly refurbished Anvil Hotel in Jackson, Wyoming is a little like stepping onto the set of some 1960s TV show about the Wild West like, say, Bonanza. But in a good way. 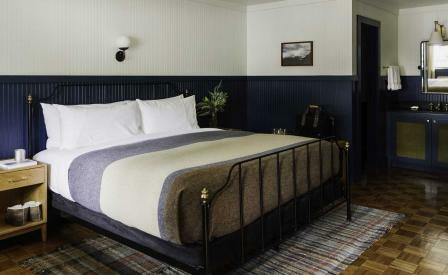 For this, due credit to hospitality group Eagle Point Hotel Partners and the New York-based Studio Tack, which has transformed a 1950s motel a block north of Jackson’s Town Square into a slick version of a classic Western lodge. All traces of the former motel have been blotted out in favour of a stylish but decidedly masculine palette. The lobby, for instance, evokes the idea of a provisional store – you almost expect Michael Landon and his Little House on the Prairie crew to come strolling in – complete with a wood burning stove and smart modern pieces from outdoor boutique Westerlind. Similarly, each of the Anvil’s 49-rooms is furnished in what the hotel describes as Alpine Modern, which translates into warm two-toned painted walls of white and navy, parquet floors, Woolrich blankets, and sconces by New York lighting company, Allied Maker. The in-house restaurant is Glorietta Trattoria – its Italian credentials and chef Troy Furuta’s menu of grilled mussels with Calabrian chili, roasted rabbit, and paparika-spiked fried chickpeas a somewhat unexpected pairing to the Anvil’s otherwise zhooshed-up wild frontier vibe.